You don't grow up in Ulster, and study engineering in Belfast, without learning about the R.M.S. Titanic. This disaster is imprinted on the Northern Irish consciousness and many "what ifs" abound. What if the ship had not been called "unsinkable" - or she had sailed further south away from the icebergs - or they had heeded the ice warnings from other ships and lowered their speed, and gave up on trying to set a speed record on her maiden voyage - or had more lifeboats, and had more lifeboat drills - or if Captain Lord of the nearby ship "Californian" had been more on the ball and more willing to come to their rescue? This ill-fated ship was built in Belfast by Harland and Wolff for the White Star Line. At 882.6 feet in length, 92.6 feet in breadth, and 46,328 gross tonnage, she was the largest and most luxurious ship of her time. She was sailing from Southampton with stops at Cherbourg, France and Queenstown, Ireland for New York, on her maiden voyage when she hit an iceberg on April 14, 1912, 11:40 P.M., 95 miles south of the Grand Banks of Newfoundland, latitude 41 46 N, longitude 50 14 W. At 2:20 A.M., April 15, she sank. 1,517 passengers and crew were lost, according to the American Inquiry. Only 706 survivors were picked up by the Cunard liner Carpathia when she arrived on the scene, four hours after receiving the Titanic's wireless distress signals, the first time S.O.S. "dit-dit-dit da-da-da dit-dit-dit" was transmitted. The Titanic was one of three very large ships built for the White Star Line. Emphasis was on luxury. Titanic was a sister ship to Olympic which worked the North Atlantic until 1935. 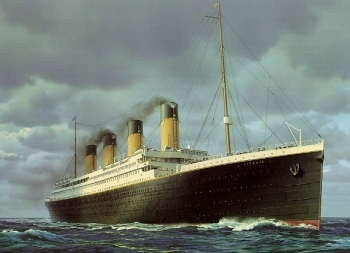 Like Olympic, Titanic was a triple-screw ship designed for a service speed of 21 knots. Her registered horsepower was 50,000, although the actual power developed was at least 55,000. Four huge funnels were an average of 150 feet from the floors of the boiler rooms. In fact, only three were used to take smoke from the furnaces. The fourth funnel, placed above the turbine hatch, the funnel nearest the stern, was also a ventilator, but it was added for looks and prestige. Titanic sailed from Belfast April 2, 1912, for Southampton, to prepare for the maiden voyage. The double-bottomed hull was divided into 16 watertight compartments. Up to four could be flooded, without sinking. Therefore she was thought to be "unsinkable", and those involved acted accordingly. The lessons learned were plentiful. The iceberg she collided with supposedly tore a 300 foot gash in her right side, rupturing five of the watertight compartments. In 1985 when the Titanic was discovered, no gash was found. Instead, the impact caused lots of rivets to pop and thereby leak. The 21 knot speed she was travelling at the time was considered later to be too fast for the conditions. Was the ship's owner trying to break the record for this Trans-Atlantic maiden voyage? There were not enough lifeboats. Only space for 1,178, when the total on board was 2,223. Only 706 were rescued. Some on the ship refused to go into the lifeboats, considering them unsafe, wouldn't separate families, or didn't believe the ship would sink. After the disaster, corrective measures were taken. There was to be lifeboat space on ships for everyone, and ships were to have searchlights. Ships' officers were to have binoculars. There were to be lifeboat drills on board, around-the-clock watches, and the International Ice Patrol was established. It took such a tragedy to bring these changes. Belfast and the engineers and employees of Harland and Wolff can still be proud. The Titanic was a well engineered and well-built ship. It was human failures to blame for the tragedy. No one had made preparations for such a happening. Simply stated, the owners and those in charge of this ship did not operate it properly. Luxury and speed interests surpassed safety. No one really knows how they would have acted if they had been on the Titanic back then, until you actually face such a danger. How would you and I have acted? Would it have been like any of these people on the Titanic? Mr. J. Bruce Ismay, Managing Director of the International Mercantile Marine, and White Star Line, who couldn't resist stepping into one of the last lifeboats, and lived to tell the tale. Captain Edward J. Smith who went down with his ship. Sir Cosmo and Lady Duff Gordon, who were in one of the first lifeboats to leave the ship with only 12, when it had capacity for 40, and they supposedly offered money to the others on board so they wouldn't go back toward the ship and try to save others, afraid that their boat might be swamped. Mr. Thomas Andrews, from Comber, Northern Ireland, Managing Director of Harland and Wolff, the company that built the ship, who when he quickly determined that the ship was doomed, worked feverishly to prepare others to save themselves, yet went down himself with the ship. Officers and crew, such as Charles H. Lighttoller, Second Officer; Herbert Pitman, Third Officer; Joseph Boxhall, Fourth Officer; Harold Lowe, Fifth Officer; James Moody, Sixth Officer; Second Wireless Operator, Harold Bride; Lookout, Frederick Fleet; Quartermaster, Robert Hitchens; Steward, William Faulker; Steward, F. Den Ray; Fire-man, Fred Barrett; Seaman, E.J. Horswell, all of them managed to survive. Mrs. Ida Straus, wife of the founder of Macy's Department Store, who refused to leave her husband, Isidor, saying We have been living together for many years, and where you go, I go. Hugh Woolner and Bjornstrom Steffanson had previously helped block other men from getting into lifeboats, but in the end, jumped into one of the last boats themselves. Officers and crew who did not survive, such as: Henry T. Wilde, Chief Officer, William M. Murdoch, First Officer, First Wireless Operator, Jack Phillips and the Ship's Musicians, all eight. All of the officers and senior employees in the Engineering Department, 38 in total. P.S. There were fifteen Andersons aboard the Titanic.- Mr. J. Anderson from 1 Cozens Court, Southampton, a Deckhand was saved. Also, a first class passenger, Harry Anderson, Waldorf Hotel, London was saved. There were twelve Andersons from Scandinavia (or the continent) that embarked at Southampton, men, women and four children, travelling third-class. Of them, only two survived. A Bedroom Steward, Mr. W. Anderson from 12 Queens Terrace, Southampton lost his life.